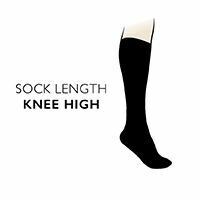 These plain, classic, cotton rich knee high socks are the perfect wardrobe basic. Their extra fine knit makes them super smooth and soft to the touch, and the Comfort Cuff won't mark your skin. Elegant, smart and beautifully simple, this timeless design is the optimum foundation garment to a ultra-chic look that's also supremely comfortable to wear all day.